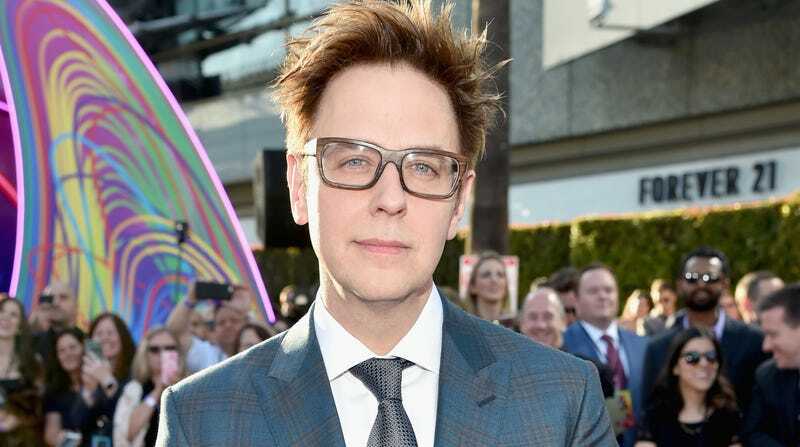 In news that’s been bubbling up on Twitter throughout the day and was just confirmed by trade publications including Deadline and The Hollywood Reporter, director James Gunn has been fired from Guardians Of The Galaxy, Vol. 3 after a group of conservative Twitter personalities that includes Jack Posobiec and Mike Cernovich dug up a series of tweets, all of them originating between 2009 and 2012, in which Gunn jokes about masturbation and pedophilia and uses an anti-transgender slur. Gunn, as you may recall, got his start working for Troma Studios, which revels in this kind of brazen immaturity and provocation. Gunn’s also been an outspoken opponent of Donald Trump, which explains why he was targeted by Cernovich et al. Disney, for its part, is not taking risks with what appears to be a calculated campaign to get Gunn fired, saying in a statement, “The offensive attitudes and statements discovered on James’ Twitter feed are indefensible and inconsistent with our studio’s values, and we have severed our business relationship with him.” Gunn has also deleted his Twitter account. UPDATE, 3:45 p.m. CT: As Deadline reports, Gunn has also been removed from the Sony Pictures panel taking place this afternoon at the San Diego Comic-Con. Gunn was set to appear on the panel promoting an as-yet-untitled horror movie he’s producing that’s—at least for now—on the studio’s schedule for November 30. UPDATE, 4:05 p.m. CT: Gunn has released a statement on his firing from Disney; you can read it below.